Just a few turns from the busy hustle of the Little River Turnpike lies what at first appears to be a simple neighborhood park where locals (and their dogs) get in their daily walks. While the numerous paved paths that encircle the property of Green Spring Gardens do attract plenty of power-walkers, there are abundant horticultural and historical aspects to be appreciated if you are willing to seek them out. The grounds include a spacious, open lawn that dips down into a woodland with a small stream and opens up again to a field of small ponds. A simple brick farmhouse that sits on the upper lawn dates back to the late 1700s, and it was on the merit of the Colonial Revival redesign of the farmhouse and property by two notable architects that qualified Green Spring for historical status in 2003. Looser formal garden elements compliment the house and blend into the natural terrain, which is the work of famed landscape designer Beatrix Ferrand (of nearby Dumbarton Oaks). Her most notable design feature is the tall semicircle of boxwood hedging behind the house, peacefully enclosing the yard from the woods beyond and creating a backdrop for a similarly curved perennial garden. It’s as pleasant as it sounds. Behind the hedges, Ferrand created some informal garden “rooms” that feel a bit tucked away, which encourage moments of quiet contemplation. As I explored the rooms during my recent spring visit, I was delighted to find one filled with huge rows of azaleas fully abloom in screaming pinks and bright whites, a sight made all the more special because it was almost hidden from view in a spot that you really had to seek out. Green Spring offers plenty of surprises for the curious garden explorer to discover. I really enjoyed the small greenhouse attached to the Horticultural Center, which made up for a lack of space by crowding every surface with unusual tropical specimens. 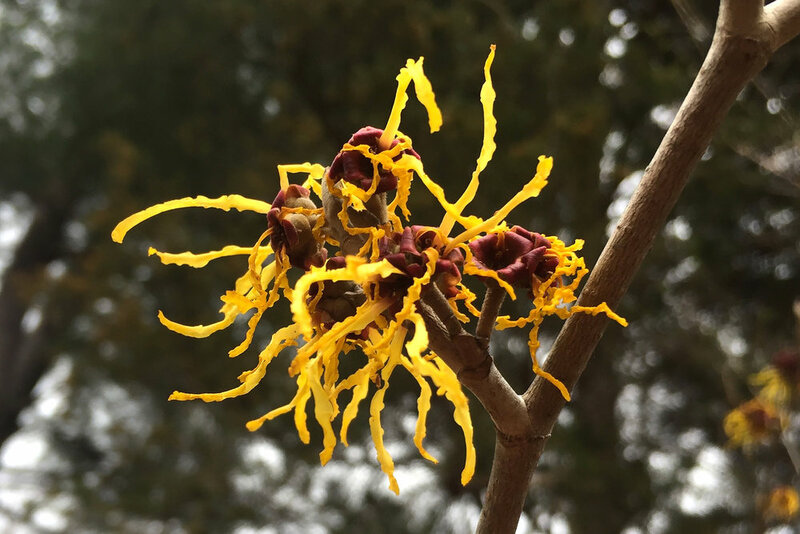 Green Spring is also known for an extensive collection of witch hazel, whose spindly flowers of deep orange and yellow light up the garden at the end of winter.